(Only size given is 38cm) Looks like Chinese branded, so unsure about quality, but seems good value for the price. Is this the one steve wears? Almost bought this a few months ago but glad I waited - still £86 quick on Amazon and more elsewhere - can't see anywhere cheaper... and it's almost Star Wars day eh! Why are you in a ponder as to whether to keep it or not? 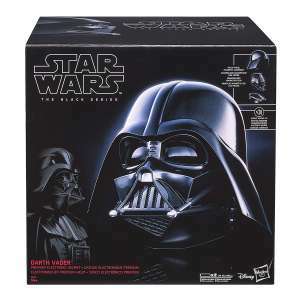 No voice changer but it does have the Darth Vader breathing sound effect. I ordered mine on Tuesday evening using the free delivery and it was delivered by courier on Thursday afternoon, really nice and quick. It's a good helmet, you won't find anything else comparable at this price. Wear underwear not a pleasant sight when you can be seen packing a web slinger. Been reading all the reactions to Shazam and it’s getting such high praise. They have knocked it out the park with this movie and can’t wait to see it. Another epic troll. Love it! Doesnt appear to fit the models wearing it however if its Lycra then being a 6'4" 17st male I think I am in with chance that it will fit and make me look like a true super hero ready to defend Planet Krypton from those pesky Romulans ! This constume is to tie in with the movie, a FEMALE captian marvel. This is a GIRLS costume. Oh dear, there's someone who doesn't know their comics! Complaining she doesn't smile enough was a great bit of feedback from fans. I can't imagine ever being offended by an actor having opinions about people insulting them. This was the movie equivalent of the battlefield farce in gaming. Oh something about SJWs. I try not to pay too much attention. https://www.mirror.co.uk/film/zachary-levi-slams-captain-marvel-14055017 Zachary Levi slams Captain Marvel hate campaign: “This is not helping” Shazam! Should be popular in Aberdeen me thinks. At least its not as embarrassing as getting out of a Kia! Never miss a 'Costume' deal again! Been trying to order since this was posted and won't let me pay. Anyone know if it's in-store too? 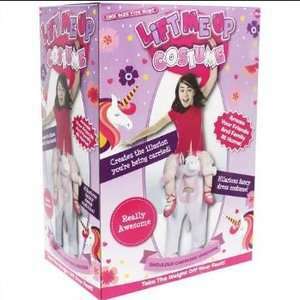 Online these show as £10 alongside many others but in the Chester Store they are all half price. Thank you so much for the reply, this has sold me on the game and the headset in one lol, I appreciate this! Oh thank you so much, if it's great then I'll be buying it! Stings the nostrells in a good way - It's made with real bits of panther. £15? Great Odin's Raven! Fancy dress costume sorted - now to get an invitation to the pants party. By the beard of Zeus! Hot! 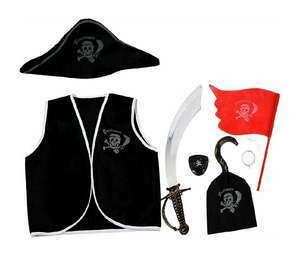 Smitty's Pirate Childrens Fancy Dress Costume sold by Amazon for £8.70 Prime or without Prime £8.70 free delivery from The Hubs seller. Just what I needed for my sessions at the Gym. Sorry should edit from The Hubs seller it's also free delivery. Cheap World book day costume. Totally agree. I try and make it about an outfit they already have Or buy charcter PJs. There are ways around minimizing wasting money. But there's escaping everyone dresses up and they love it, it breaks up the hum drum of their school day. But yes it's a waste of money buying something will only wear once or twice for sure and should be better spent on books. Agreed. I have a school age child. It is such a shame this is a thing. Wasting money on crap costumes. Pressure on parents to come up with a cool outfit. This day should be about buying a new book for your child to read in my opinion. Rant over. 9.59 delivered if not got prime. Sorry should edit. From other sellers it's 9.59 delivered. Still getting the hang of posting a deal. School’s encourage the kids to dress up as their favourite character, so the kids want an outfit and the parents hands are sort of forced. Whilst perhaps you don’t have to sort an outfit, most people will want to as they don’t want their child not to join in. I think 'having' is the key word there. I think it’s excellent too, instead of having to either spend hours preparing a costume at home or forking out £30 from a costume shop I can get my kid kitted out cheaply from the local supermarket. I think its excellent that supermarkets have taken over a day about reading books to flog cheap costumes. Hoping Base do a price beat on this... Not a price match. A price beat. Imagine all the saps walking into Cex... Paying £40 for a second hand copy, and not even getting any of the pre-order DLC for their efforts. Saps. DOA 5 has a f2p version. This may also get a f2p version (lite version) post release.